Do You Eat Honey From China? Before I get to the issue of honey from China as discussed in the article on Chinese Honey, I would like to share a bit on how I see commercial honey as a whole. I live in an urban food desert, where the agricultural sector is virtually absent and almost all fresh produce, including honey, is imported. Honey has always been scarce to me since the day I realised the sweet liquid came from the bees. I have yet to feel in the slightest that the global colony collapse disorder disaster has affected its scarcity in any way. I always thought I had been reasonably determined in identifying the sources of the food I buy but was recently told off by a beekeeper that I should be more aggressive in my attempt to get to the bottom of the source of honey I eat. Honestly, I was a bit confounded and discouraged. On the subject of honey consumption, I hold on to the belief that we eat the best that is known and available to you, at a price that we can afford. How many people can actually afford to eat "honey fit for the kings and ministers"? It's incredible that even a commodity like honey (or is it not anymore) has to end up in a place of scrambling for the most premium spots in the market. It's mind-blowing to think that consumers could actually end up paying an indecent amount for intense marketing and research just to have prestigious institutions (for inctance, UMF) and labs prove and certify that certain honey is of great quality. Isn't honey just honey? No, with the diverse beliefs and practices in beekeeping all over the world, all honey is not created equal, and not when it has gone through the multiple layers and channels of the distribution system. So, isn't it better for people who have zero access to beekeepers and bee farms to eat certain honey or not to eat at all, taking into account the fierce onslaught of today's highly refined sugar, high fructose corn syrup, and artificial sugars? And considering the nature of man or should I just say how all economies in the world are run, we will never see the day when everyone in this world, rich and poor, get to eat the most luxurious quality honey in this world at the price of commodities. I really should understand this better than anyone else since I live in a country where virtually every concern related to systems and policies is responded with a rigorous economic reasoning. But I also got a firm answer for this when a European beekeeper recently was trying get me help him to export and sell the "purest honey" from his farm and I probably cheesed him off by suggesting that he could look into how he could help take care of the locals first, keep his purest honey and help make honey accessible and affordable to the locals. As I meet more and more beekeepers from all over, the concern about maximising profit (not just survival issues) is extremely real. I'm not trying to be judgemental here, but different people do see honey with very different eyes. There are many beekeepers whose love for bees exudes through and through and supersedes any interest in the health benefits of honey, and also those who are single-mindedly focussed on the pure desire to prosper a business by keeping bees. And, rarely, I also meet beekeepers who refrains from talking to me about beekeeping (because they realise I know nuts about it) but share with me so freely and passionately about the benefits of honey. And to finally answer the question more bluntly whether I would eat honey from China, no, I wouldn't. I'm just a regular consumer of the ever powerful media that has set an agenda of what I should be worrying and thinking about. Also, so far I haven't come across a report that is assuring enough to cajole me into eating Chinese honey with peace of mind. And the interaction with my Chinese friends from China hasn't changed my stance on the topic yet. This prejudice has also affected my perception of American honey for obvious reasons. Unless I can ascertain that the honey is sourced 100% from the USA, I would rather err on the safe side to assume that the honey is imported from China and packed in the US. And what if I were there in China like Tara to see with my own eyes? Well, still no, I can only say that the socio-semiotic impact of the red plastic pail and bucket in Tara's story has too much of an overwhelmingly negative impact on my belief about the honey in there. 1. Tara's personal encounter with Chinese honey: Chinese Honey. What's in There? 2. Raw honey, local honey, pure honey, or organic honey... which honey to buy? More in: Which Honey to Buy? 3. 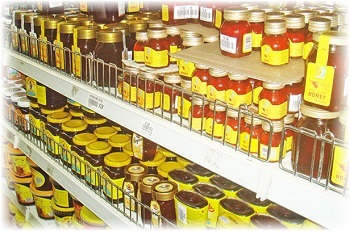 Read John Smith's take on Chinese honey: Is Chinese Honey Fake Honey?. End of "Do You Eat Honey From China?" Back to "Back to Chinese Honey, What's In It? ".